If he wins, it will be a death blow to the big-spending DC establishment. Can't read this email? Click here. Remember this name: MATT BEVIN. He's the man the Washington establishment fears most. 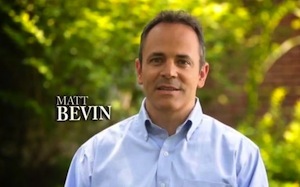 Matt Bevin (R-KY) is the conservative candidate running against U.S. Senator Mitch McConnell (R-KY) in Kentucky. He is attempting to defeat a party leader in a primary election, something that has never been done in the history of this country. Mitch McConnell refuses to listen to the grassroots and has sided with the Democrats to pass bailouts, debt increases, tax hikes, and Obamacare funding. If Matt Bevin wins, it will be a major blow to the big-spending DC establishment. Not only will it replace a liberal, 30-year incumbent Republican with a constitutional conservative, it will send a message to every politician in Washington that we, the people, control this country, not them. Please read John Harwood's interview with Matt Bevin below and then forward this email to every freedom-loving American you know. You can also help by donating to Matt Bevin's campaign. He is up against tens of millions of dollars so every contribution counts. Before Senator Mitch McConnell of Kentucky can face off against Alison Lundergan Grimes, a Democrat and Kentucky's secretary of state, he must turn back a primary challenge from Matt Bevin, a 46-year-old investment executive who has Tea Party support. Alternately attacked and ignored by Mr. McConnell and his allies, Mr. Bevin has criticized the Republican leader for "surrender" in the recent deal with Democrats that ended the government shutdown and extended the nation's borrowing authority. Mr. Bevin has vowed to repeat the 2010 success of Senator Rand Paul in beating an establishment Republican. John Harwood of The Times and CNBC interviewed Mr. Bevin in his campaign headquarters outside Louisville. What follows is a condensed, edited version of their conversation. Q. A lot of people watching this interview think Mitch McConnell just struck a deal with the president and Harry Reid that saved the world economy from a meltdown. Why should you run against him? A. There was no threat of default. And as is often the case in Washington there are these faux crises that are foisted upon us — whether it was this most recent one with the potential threat of default, whether it was the fiscal cliff. Many of these things are Chicken Little-like — the sky is falling — when in fact that's not the case. Under the cover of these crises and the resolution of these crises, there's any amount of pork that gets foisted about, and billions of our dollars get wasted under the guise of protecting us. The American people are tired of it, the people of Kentucky are tired of it. Q. Since the crisis there's an almost unanimous sentiment among the Republican Party that in addition to hurting the country, the shutdown hurt the Republican Party. What about that don't you get? A. I understand exactly what polls are telling us but you have to look at the source of those. I also see the very man who supposedly was responsible for this hurting [Senator Ted Cruz, Republican of Texas] just received an eight-minute standing ovation when he went home to his state. The fact is the American people want men and women to stand up and represent them, and to put their interests ahead of the party interests. Too many of the career politicians, the established politicians in Washington on both sides of the aisle are representing their party more than the people. And no matter what the media says, the ballot box will determine what people truly believe. Q. How would you explain what your governing agenda is, and why you could achieve it more effectively than Mitch McConnell? A. I'll listen to the people. I will not put my party ahead of what the people want. I am a believer in smaller government, limited government, less regulation, less taxes, because I think to have more of those things we suffocate the entrepreneurial spirit of this nation. It is critical that we've got to start to dial back the scale of government. We have $17-trillion in debt, we have a G.D.P. of $15.1-trillion. It is unsustainable. The path we are on financially is unsustainable. Q. The programs that put the "big" in big government are Medicare and Social Security. What specifically would you do about them? Raise the age of eligibility? A. There has to be fiscal responsibility applied. There has to be common sense. These programs are going broke. They are bankrupt. Look at the requirements for eligibility on two fronts — both in terms of means-testing if it comes to that, but more critically and more importantly, look at the demographics. When these programs were created, the recipients on average lived a few years beyond the point at which they were eligible. Now they're living as long as half their lives after the point that they become eligible — decades and decades. This is what's making it unsustainable. Whether it's 2, 3, 5, 7 years for people who have yet to join the program, the fact is we need to start moving in a different direction and we have to start now. I don't believe in cutting for those who are now receiving. Q. What's an example of where you think Mitch McConnell has put party before country? A. Syria was a perfect example. He couldn't decide until the last minute what he believed, because he wanted to side with the party and the party wanted to go to war. The American people overwhelmingly said we don't have any interest in this. Amnesty — any number of corporate interests who line Mitch McConnell's campaign coffers are very in favor of expanding amnesty yet again. Mitch McConnell voted for it in 1986, he voted for it in 2006. He voted for it in 2007, and then changed his vote and pretended he didn't. He was very silent this time because he's running for re-election. Too often we have aligned ourselves with larger corporate interests and we've done it at the expense of the people — of all communities. Q. Mitch McConnell has told his team to build the greatest Senate campaign in the history of the country. Why should anyone think that you as someone who's never run for office before can overcome that? A. Is what you've seen coming from Mitch McConnell, in your estimation, the greatest Senate campaign you've ever seen? The only Republican in the state of Kentucky who can lose this seat is the guy who's in it. Mitch McConnell will lose this race. In the history of the United States there has never been a Congressional leader in either the House or the Senate who has ever lost a primary — ever. This will happen. The more his people talk the better it is for my campaign. Q. They've called you Bailout Bevin, they said you didn't pay your taxes, they said you exaggerated your ties to M.I.T., said you voted for a third-party guy in 2008 who's on YouTube waving a Confederate flag. Have those things hurt you? A. They have not because they're not true. When you have a 37 percent approval rating, the only way you have to get re-elected is to make the people running against you less popular than yourself. So I think we've only begun to see the tip of the iceberg. He makes these claims up, and then he runs ads about them, and I think he'll continue to do that. Gandhi said first they ignore you, then they ridicule you, then they attack you, and then you win. So we're somewhere on that spectrum. Q. His people have talked about raising tens of millions of dollars. How much can you raise, and how much of your own money are you willing to put in? A. We will not match him dollar for dollar, nor will we try. This is not a race that is going to be purchased. He believes he can buy this seat again. I believe he's wrong. He will put a 1 or a 2 in front of any number we raise. We'll need $4-million to $8-million to win this race. That's what it will take, and we'll need to turn the voters out. We will raise the money. I don't intend to buy it myself. Buying your way in with your own money doesn't turn people out. Q. If you're so great as a Tea Party candidate, why isn't Rand Paul for you? A. Who says I am so great? I've not made that claim. But the fact is that people want an alternative. You'll have to ask Rand — folks can guess to what his aspirations might be, and what avenues he needs to take to attain those aspirations. But here's what I'll tell you. Rand Paul is only one vote — and everyone who ultimately coalesced behind him is already behind me. I've known Rand a long time. I was there the night he was elected. I was with him in his suite before he went down. He knows full well that he and I are cut from very, very similar cloth — and that he and Mitch McConnell are not. He understands that. Q. Have you spoken to Ted Cruz about your race, and is he going to help you? A. I have spoken to Ted Cruz. Many of the conversations I've had with people were had in private for a reason. They have more in play as elected officials right now than I do. Out of respect for them, I'm going to defer to them as to when they choose to talk about the conversations we've had. It's disadvantageous to get the cart ahead of the horse. You're receiving this email because you subscribed to the Senate Conservatives email list. Please do not reply to this message; click here to contact us. Senate Conservatives Fund (SCF) is an independent, grassroots organization dedicated to electing true conservatives to the United States Senate. SCF only supports candidates who have the courage to put principle ahead of party and fight for limited government, a strong national defense, and traditional family values. SCF is not affiliated with the Republican Party or any of its campaign committees. Contributions to the Senate Conservatives Fund PAC are not deductible as charitable contributions. Contributions from corporations or foreign nationals lacking permanent resident status are not permitted. Federal law requires Senate Conservatives Fund to report the name, mailing address, occupation and employer for each individual whose contributions aggregate in excess of $200 in a calendar year. Copyright © 2013 Senate Conservatives, All rights reserved.